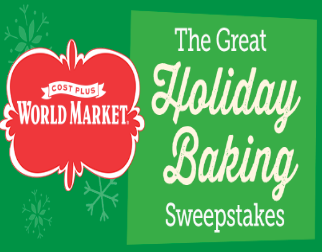 Cost Plus World Market Great Holiday Baking Sweepstakes – Win a trip to London & more! Win a trip for 2 to London & more! ELIGIBILITY – The Cost Plus World Market Great Holiday Baking Sweepstakes is open to legal residents of the fifty (50) United States and District of Columbia who are 21 years of age or older at the time of entry (excluding residents of Puerto Rico, and all other U.S. territories and possessions). SWEEPSTAKES ENTRY PERIOD – The Promotion begins at 12:01 a.m. Eastern Time (“ET”) on 11/21/16 and ends at 11:59 p.m. ET on 12/31/16.